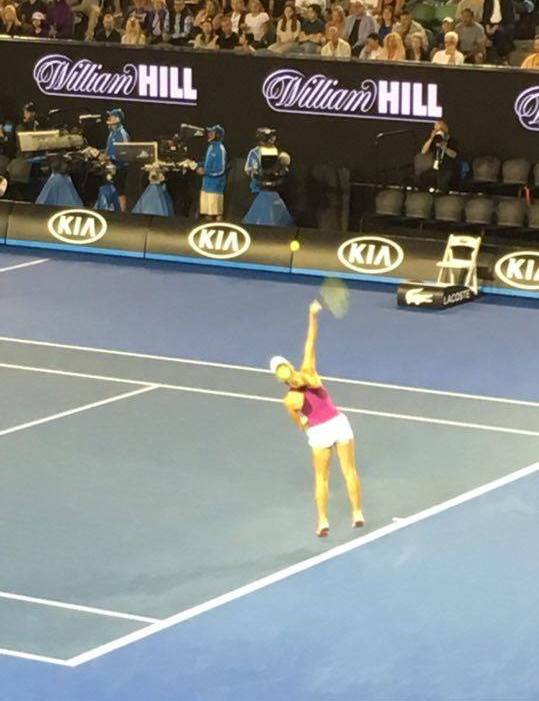 Hi everyone, my name is Mitch (@carnesy56 on Twitter) and this is part two of my post from the 2016 Australian Open. For part one covering the first week of the tournament, click here. 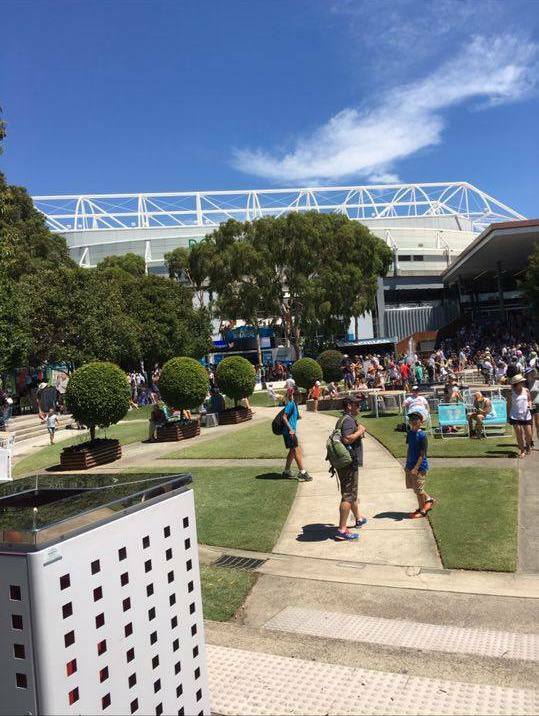 As the tournament progresses, the crowds naturally thin out and Melbourne Park becomes an attraction for a greater number of corporate clientele. Week Two also showcases different events, such as the juniors; wheelchair tennis; legends events and more doubles. These events are quite often undersold at Grand Slams but can produce really entertaining tennis for fans. The shift I most remember from the second week was the morning of the quarter final in which Kerber took on Azarenka. Before my shift starts, each staff member is allocated to a different location in or outside the grounds. Predictably, I got the busiest spot possible in Garden Square which is located just inside the main entrance of Melbourne Park. Thankfully, there was the big screen I could take a sneak peak at. I did not expect Kerber to do much in that match given that she held a 0-6 H2H record against Azarenka and had lost handily 36 16 in the Brisbane final. Kerber started well enough, breaking to love and saving a break point to go 20 ahead. She managed to double this lead before Azarenka mounted a comeback, climbing back to 43 and having break points to level the first set. Thankfully, Kerber held on and managed to take the first set 63. I couldn’t help give a fist pump which prompted a patron to say “Well, I know who you are supporting.” I don’t recall much else about my shift, other than convincing a Chinese man to purchase a ticket to see Konta play Zhang. I hope he didn’t hold that against me in the end. The second set saw Kerber fall behind early in the second, and my stress levels raise, and more patrons streaming in. As Kerber fell behind 25 in the second set, I was relieved for a break and I decided to take a walk around the grounds. 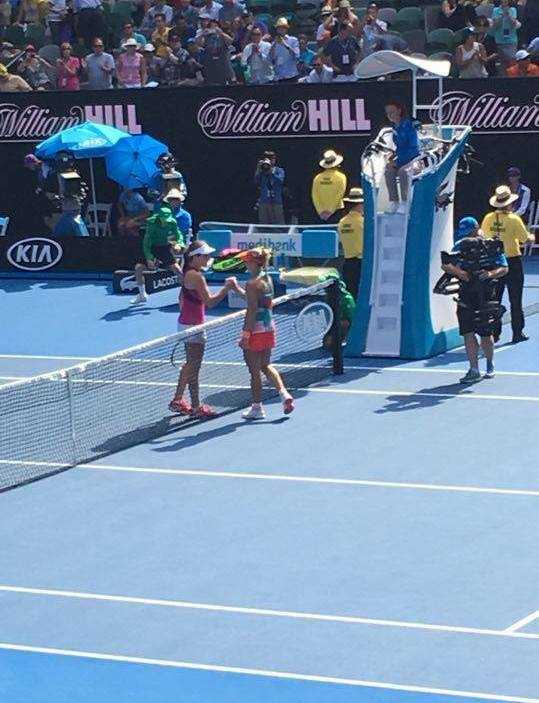 Kerber then mounted a supreme comeback, fighting back from 25 40-0 down on return; and again 45 40-15 down on return. Kerber managed to beat Azarenka 63 75 in one of her best career wins. It was hard to describe how much that win meant to me. It’s safe to say that my eyes were no longer dry, but I was glad to have my sunglasses on. After Kerber’s astonishing win over Azarenka, I knew I just had to try and attend the SFs. I managed to find great seats down in the bottom section of the stands, so I booked immediately on my phone. 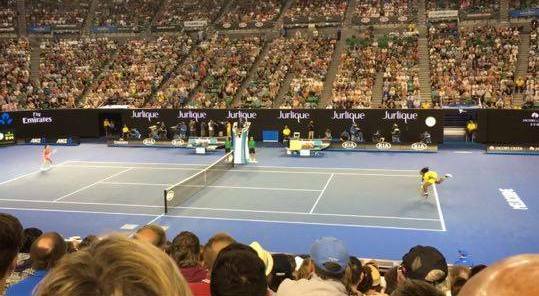 It is very easy to purchase tickets for the Australian Open. My friend, who decided to accompany me, is an avid Radwanska fan so I was hoping that we might get an Aga v Angie final. I knew that Serena Williams was in great form and when it was announced that the roof would be shut, I wasn’t overly hopeful for Radwanska as the speed of the courts would naturally quicken in an indoor environment. The first set was a flawless and intimidating display from Williams. The score read 60 and barely 20 minutes had passed. Radwanska was not playing badly at all. In the second set, Radwanska started to get into the match and showed consummate skill in flummoxing Williams with drop shots, volleys and tricky shot selection. With Radwanska serving at 44, 40-15, I thought that maybe this would prove to be similar to the 2012 Wimbledon final where Radwanska pushed Williams to a third. However, it wasn’t to be. Williams managed to break in that 9th game and she then served out the match to love, giving her the opportunity to compete in her 26th major final. 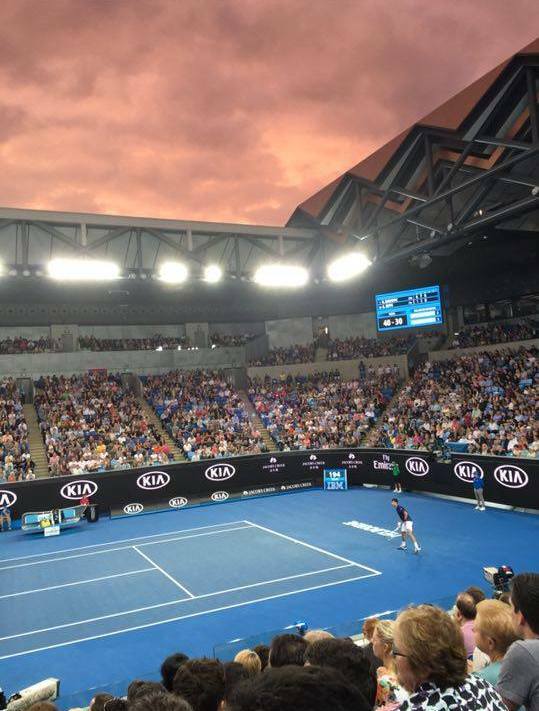 The rain had subsided for the second semi-final and the roof was opened up. I was just so excited to think that Kerber could actually make a grand slam final. Kerber started well, opening up a three game lead before Konta managed to settle with four straight games. Both players were pulling the other wide by using the angles and pace of the court well. I also managed to earn some pointed stares this time when Kerber broke to get ahead 65 in the first set, this time from British supporters in front of me. Kerber would serve out the first set to love. I think that relaxed her as she managed to win the second set 62, without having too many issues. To see my tennis idol make a grand slam final before my very eyes was something indescribable. To end my Australian Open journey, predictably, I decided to try and get a ticket for the women’s final. It was such an amazing opportunity to see my favourite player compete in a Grand Slam final, that I couldn’t pass it up. 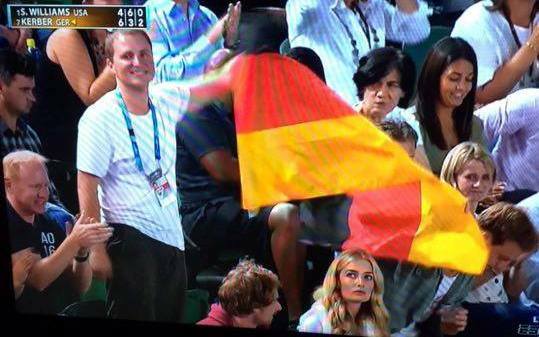 I managed to secure a ticket and arrived at Rod Laver Arena about 15 minutes before play began, with my German flag in tow. I asked the spectators sitting next to me who they were supporting and they responded with “Germany now.” I guess I’m more intimidating than I seem. I knew the first set would be crucial as Kerber was bound to be nervous. Serena held quite comfortably in the opening game, and Kerber started her service game at 15-30. I knew once she got the scoreboard going, she would settle more. Thankfully she held and then broke Williams to go up 21. Kerber was playing a smart game with a mix of pace, depth and her unrivalled consistency. She was causing Williams all sorts of trouble at the net, and her ability to make Williams play that extra shot resulted in a large number of unforced errors. Kerber managed to serve out the set to love and take it 64. I was so happy she had gotten a set! The second set began and Williams had tidied up her game significantly. Williams broke for 31 and the match stayed on serve going into a deciding set. I thought back to the match that Williams played against Safarova at Roland Garros last year and how well Lucie played to force a deciding set and I felt happy that Kerber had matched Lucie. I didn’t hold many expectations going into the deciding set. Kerber played a good service game to move ahead 10 but then came a BREAK TO LOVE. Kerber retrieved every ball and played some outstanding passing shots to press ahead 20. The crowd really started to get behind Kerber. 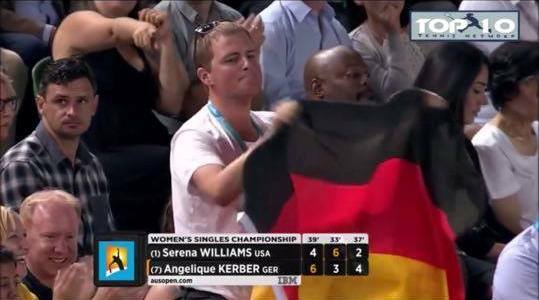 Williams manage to break back and Kerber stayed ahead at 32 with another hold. A pivotal game then ensued. Both Kerber and Williams engaged in a titanic game lasting ten minutes with Kerber taking a 42 lead on her FIFTH break point of the game. Kerber played two courageous drop shots on game point down and managed to make Williams play so many extra balls. Once Williams finally hit long, Kerber broke and quickly consolidated to lead 52. Predictably, Williams did not go away. She promptly held and broke to 30 to reduce the arrears to 45 and the match was back on serve. The last game turned out to be quite thrilling and an emotional rollercoaster. I thought Kerber had it won early in the game and then thought she had blown her opportunity. Williams went down 0-30, only for her to win the next three points with an ace and two long rallies. Kerber then punished a weak Williams second serve to ease the scoreline back to Deuce. The penultimate point of the match provided a long rally with Kerber finally changing direction of the ball, and causing Williams’s forehand to clip the tape. Kerber had AD-Out. It’s funny that the last title she won, the score was AD-out when she won (against Pliskova in Stanford). Williams hit a decent first serve and came charging into the net, only for her forehand volley to fly long. 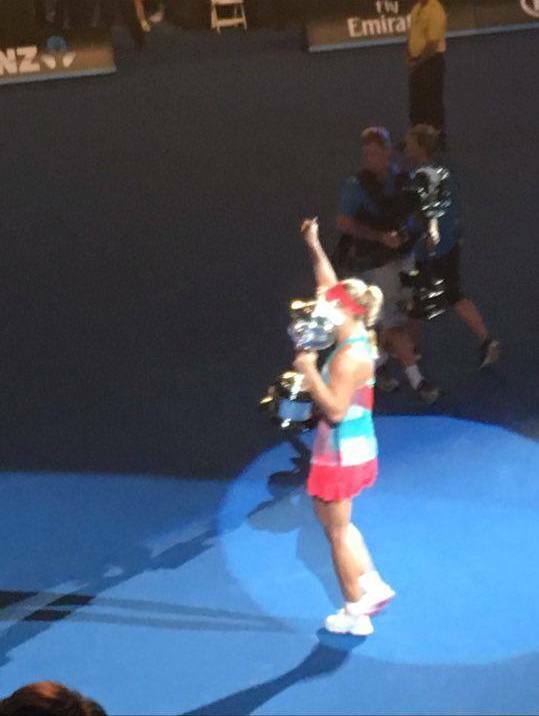 I still could not believe it when the ball sailed long and Kerber had become the Australian Open Champion, and her life had changed forever. • Running through Melbourne Park to Hisense Arena to watch the final three games of Gavrilova’s epic win over Mladenovic in the third round. • Watching Shuai Zhang make her first Australian Open Quarterfinal at Rod Laver Arena. • Talking tennis with patrons and friends from all over the world. • Watching one of my favourite up and comers, Austin Krajicek play Kei Nishikori under the roof on Margaret Court Arena. Indoor tennis is just such a nice novelty. As I look back at this 2016 Australian Open, I just appreciate the unbelievable tennis I got to see; the amazing people I got to meet; and the wonderful atmosphere. For anyone who isn’t sure whether to attend the Australian Open, I really cannot recommend it enough. So many players refer to the Australian Open as their favourite slam and I can really see why. It’s unbelievable that I could manage to find a ticket for the Women’s final, the day before. The first week is definitely a lot busier, with more players and bigger crowds. The second week thins out and sees a lot more corporate clientele that come through the gates. The best part of the Australian Open has to be the tennis. Being able to see the best players in the world and seeing them compete at Grand Slam level is something I will never take for granted. Thank you for reading, and I really can’t wait to go back in 2017! Thanks for that post, Mitch! Lovely to read this from a perspective of an Angie fan 🙂 I was sitting in front of my TV and, most probably, went through the same emotions as you. Thanks Mitch,I live in Sydney,have often attended the ‘Happy Slam’ as a reporter and also just as a fan,I have been to the other GS,not being biased at all:),is great from a fans point of view,watching from Rod Laver you get a great view,even if you are up high in the stands,you dont feel that far away from players,also we have 3 stadiums with roofs.I really enjoyed reading your personal perspective. Great post, Mitch! I’m looking forward to go to Australian Open one day. Nice to know it’s not difficult to find tickets, I heard it’s not this easy at other Slams.